1 In large bowl, stir together dry cake mix and pudding mix. In another bowl, combine all wet ingredients and eggs that the cake mix calls for plus the buttermilk. 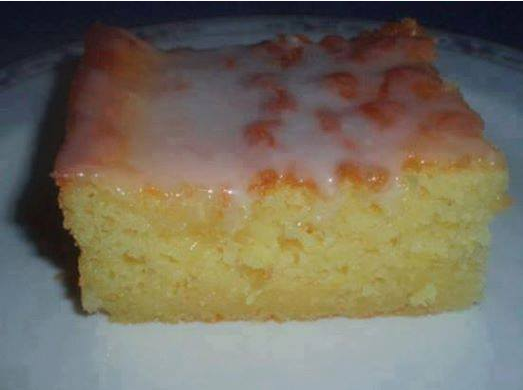 (where your box reads the amount of water (1 1/3 cup usually), put in 1 cup water and 1/3 cup lemon juice to make the cake even more lemon tasting, if you like) Beat with mixer until blended. Add to dry mixture and beat until combined. Bake in a greased 9x13 baking pan in a preheated 350 degree oven for the time the cake mix box calls for...depending on your oven. It will require a couple minutes longer baking time than cake mix box calls for because of the extra moisture produced by the milk. Stick a toothpick in the center to check for doneness.